We have to admit, the Yorkshire weather did look threatening on Sunday. 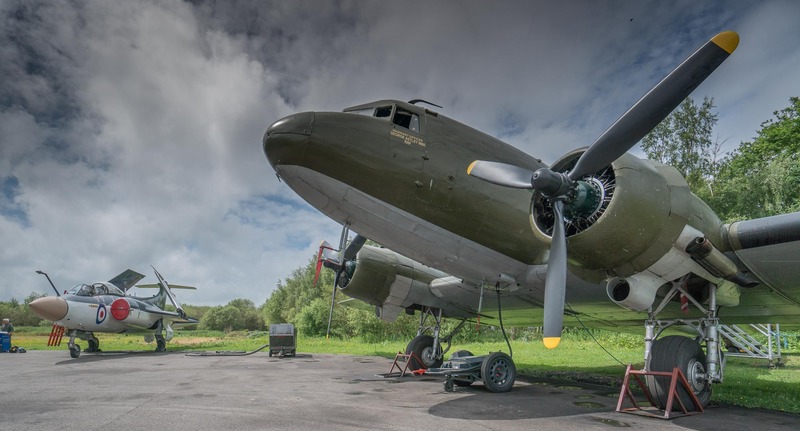 However, once again, we were blessed with mild weather and even periods of blue skies that defied the weather forecast and allowed us to enjoy Reach For The Sky and for our visitors to enjoy a great day out at the Museum and learn more about the history of the Royal Air Force. The Royal Air Force were with us, explaining to younger people all about future careers in the RAf and also, the RAF Baton Relay Team spent some time with us as they work their way around the UK. The great team of volunteers who care for our Nimrod XV250 were with us and gave visitors a rare chance to enjoy tours of this great aircraft. Our Nimrod is maintained in full ground running condition so the interior of this jet is a fascinating experience. Thirsk Yarnbombers had been really busy in the days leading up to the event and the Museum was adorned with their creations to celebrate RAF100. Meanwhile, across at our live aircraft, our team of volunteer engineers prepared the aircraft to run while Museum guides gave some engaging presentations on the different periods of the history of the RAF. We hope everyone had a wonderful day out and if you missed Reach For The Sky, keep checking our events calendar for more details of this summer’s busy schedule.